The structural pieces are laser cut out of 1/8” birch plywood. The kit includes the base, three floors that are etched to resemble hardwood flooring, the exterior walls are grooved were the floors slide in and the corners of walls and roof pieces are tabbed and notched for easy assembly and 5 interior walls. 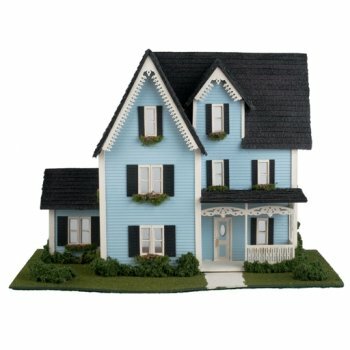 The exterior materials include precut siding, shingle, gingerbread trims, railings, and corner trims. The interior materials include wallpaper, baseboards, cove molding, and trims for the edges of the walls and floors. Also included are all laser cut parts for doors, window casings, window frames, shutters, Plexiglas, and window boxes. Landscaping materials include grass, bushes, foliage for window boxes and vines, and 2 bags of flowers; one mixed flowers for window boxes, one color for bushes and vines. Last but not least each ¼” house kit comes with a piece of felt for the bottom of the base in order to avoid scratching the service it is displayed on. The step by step instructions are detailed with diagrams and pictures.